The Hamels Foundation exciting fundraiser will be held at Union Trust Steak House. 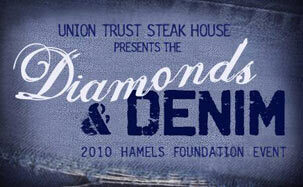 Diamonds and Denim, an inaugural event benefiting The Hamels Foundation, will take place Thursday, September 23rd at the Union Trust Steak House in Center City. Attendees will have the chance to experience an exceptional evening while raising money for the foundation founded by Phillies’s star Cole Hamels and his wife Heidi. Diamonds and Denim encourages guests to sport their best denim and high fashion, enjoy cocktails and appetizers, laugh with comedian Joe Conklin and bid on live auction items. “I am from Southern Missouri so I wanted to bring a bit of a fun, Southern feel to this event and get everyone excited about the concept. 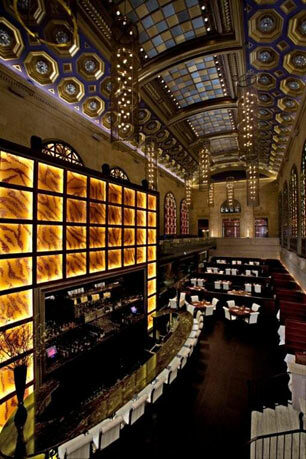 And Union Trust is such a fantastic location for a party,” explained Heidi Hamels. Beginning in 2008, The Hamels Foundation has been dedicated to bringing an end to extreme poverty and hardship endured by lack of educational support. The Hamels Foundation’s commitment extends globally to Malawi, Africa, where they began building a boarding school for girls in July, 2009. Malawi is one of the poorest, most impoverished nations in the world with an overwhelming HIV and AIDS epidemic. The Hamels Foundation’s school will offer critical intervention to young women and girls in Malawi. Through female empowerment, education and AIDS awareness programs, The Hamels Foundation aims to break the cycle of disease and poverty and improve the futures of its students. With a charity that is based around a very serious topic, Heidi Hamels said she wanted to make Diamonds and Denim very entertaining while celebrating their mission and goals. “Everyone who attends will have access to interact and meet over fifty celebrities from soap opera stars, athletes, QVC hosts, and musicians. And we are giving away thousands of dollars in diamonds courtesy of Bernie Robbins. You get to buy a key and if your key unlocks the trunk, you could win up to $25,000 worth of diamonds,” enthused Heidi. Ticket Purchase: $300.00/pp or $500.00/couple Click here to purchase tickets. Kindly note this event is expected to sell out! Visit thehamelsfoundation.org for more information. « Bug Fest is Back at the Academy of Natural Sciences!